I have gotten so much braver since beginning my furniture business. I have begun considering purchases that I would not have before. In fact, I would have thought myself crazy for even considering this recent purchase I am going to tell you about. For some reason, French furniture never appealed to me until recently. All those curves and plump parts looked a little too girly for me. Then, I came across a French serving cart in a thrift store that was a great price, but needed a makeover. I was not at all sure that I could get into it, but I decided to have fun with it, and it came out great. I'll show you that in another post. 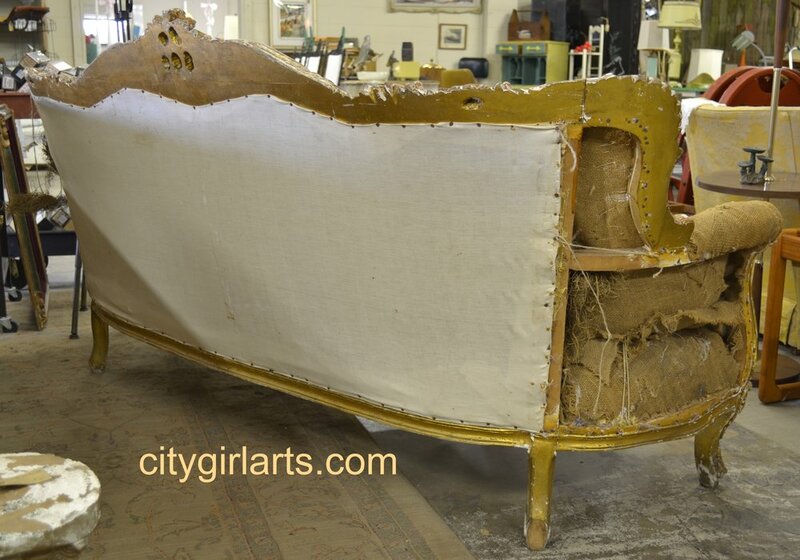 So, after that, I found a gorgeous French bombe-style dresser that needs a redo but I haven't gotten to yet. I'm savoring it for a color scheme that I can't decide on. Okay, yes, it needed work. But it was amazing. It used to be gilded and shiny! Parts of it still were! It was old! Shiny! Old! It had burlap on it! Old burlap! Foreign writing! Hay hanging out! How much cooler could it get?? I took photos and chatted with the seller. Turns out she found it in Tennessee and brought it back to sell in the big city. She took the fabric off because it was horrible, which was a good move. It was very sturdy, and heavy. I drooled, imagined, stroked it, and left. I had been on my way to rearrange my pieces at the vintage market, so I showed the photo to the manager there. She affirmed my attraction to the amazing sofa. I thought about it all afternoon. I had hoped that it wouldn't be there when I got back because I really wasn't at all sure of what to do with it. But I had to have it. I didn't know if I would attempt to reupholster it, have it done professionally, or re-sell it. But I had to have it. Obviously, it was still there, and meant for me! I made a deal with the seller, brought it home, and Mr. City Girl nearly had a cow. He thought I had gone completely nuts. But that's why he has the 9 to 5, right? I took it over to the market, and most of the vendors I asked there had an opinion. Interestingly, it was split down gender lines: Men who thought it was cool: Zero. Women who thought it was cool: All. Validated. I'm no forensic scientist, but there were some clues as to its history. A friend had the Arabic writing translated. It said, "Made in Syria" along with the name of the company, which no longer exists, and their phone number. It was obviously old, with old school furniture upholstery methods, like hay for padding. So it may be pre-1943, since France occupied Syria from 1920 until 1943, and may have had some influence over the styles in that country at that time. Since I didn't have any room for the huge piece at my house and workshop, I put a price on it for the market. I really didn't expect to sell it, nor did I really want to, but I thought I could think about it for a while safely. Within four hours of opening that day, a couple fell head over heels just like I did, and couldn't leave it there. I was happy to have them take it home and do something wonderful with it. At least I had it for a little while! Leave me a comment? I appreciate comments and generally respond by email. Check out my Etsy shop for some nice items. I also have furniture adventures on facebook.